There has been a lot of talk about massive, open, online classes (MOOCs) like those taught at Stanford earlier this year. But what about massive face-face classes? Last year I saw John Boyer give a presentation on his 2,670 student, face-to-face World Regions geography class at Virginia Tech. The class typically had 50-70 students when Boyer began teaching it in 1998. 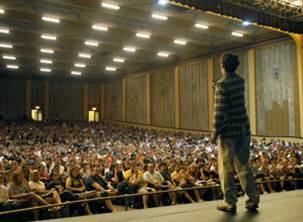 As the word got out, enrollment grew and the class moved from a classroom to a lecture hall to a large auditorium. The weekly class meets for four hours, with a one hour dinner break. 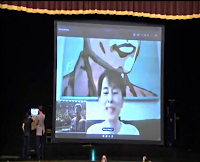 He has students interact with each other during the class, and also conducts Skype interviews on stage. His most famous interview was with Myanmar's Aung San Suu Kyi. 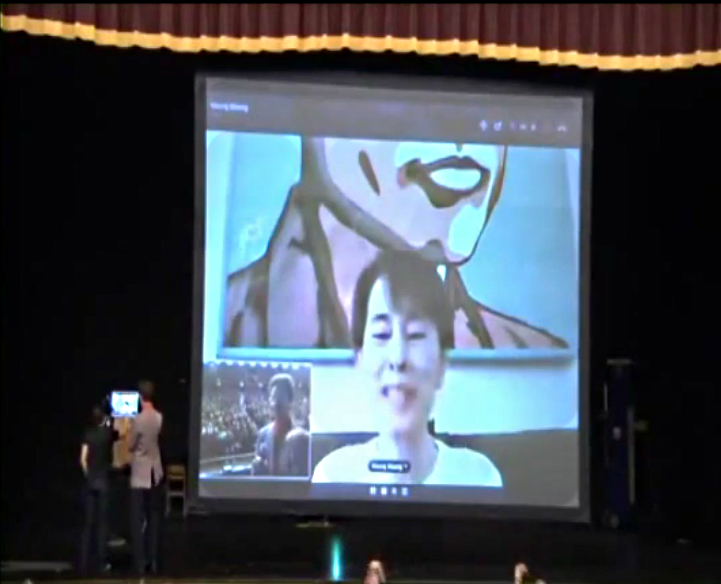 He and his class invited her to do the interview in a short (1:36) video clip. Check it out and you will see his trademark plaid jacket and get a feel for his style. You will also see nearly 3,000 cheering students. She accepted their invitation and you can see the interview (33:37) in which students ask questions below. Be sure to watch the last couple of minutes. As you see, Boyer is a flamboyant teacher who takes plenty of risks and they seem to pay off. He holds his office hours online and the class uses the hashtag #wrvt. For his office hours, textbook, weekly news and more, go to his Web site. A class this large needs less structure, not more. For example, he provides a menu of activities and allows students to select what they will do to accumulate points toward a grade. A class this large cannot work unless students communicate with and help other students. The teacher knows a lot about the topic, but the students collectively know a lot he does not know. (Michal Wesch, who teaches anthropology says the same thing). I did not get around to writing this post when I saw Boyer last year, but was reminded of him by an article in the Chronicle of Higher Education today. Check it out and see his student's comments here. Finally, I saw Boyer's presentation at the Campus Technology Forum. I've been to three of them, and they were all excellent learning experiences. At first, new media mimic old media. Early movies were made by filming stage plays with a stationary camera. We still see a few movies based on stage plays, but they are uncommon today. Early television shows often had performers acting in play-like sets or standing on a stage reminiscent of vaudeville. Books followed a similar pattern. Johannes Gutenberg’s 1455 bible was the first book printed using movable metal type. The Gutenberg Bible resembled the hand written manuscripts on which it was based. It did not have punctuation or paragraphs, the pages were around 12 by 17.5 inches and its illustrations were added for beauty and feeling, not clarification. It was like the hand copied books that preceded it -- a religious book suitable for contemplative reading in a library. Gutenberg’s breakthrough was in production, not format or content. Fifty years after Gutenberg, Aldus improved production by printing eight pages on a single sheet. This led to smaller, portable books that could be carried or placed in a saddle bag. Aldus also introduced punctuation like the commas, periods and semicolons shown here, and italic type, which fit more letters on a page. But, like Gutenberg, Aldus would be surprised by the variety of punctuation and typography in today’s textbooks as well as innovations like chapters, callouts, indices, tables, diagrams, tables of contents and images with captions. Textbooks today are at the “Gutenberg bible” stage. Textbook publishers have digitized their books, making them available online in various formats. Many maintain the notion of a book-sized page and often preserve the page numbering of the print version. These e-books look better than PDF documents, but they are constrained by the previous format. Like Aldus, they have gone somewhat beyond their predecessor, but remain tied to the notion that the course is contained in a book of pages. Many universities are offering online classes, but these also emulate the past. They typically offer the "same" course online as they teach in the classroom. They may record lectures, use digital textbooks, and substitute threaded discussion for in-class discussion and administer assignments and tests using a course management system, but the course and teaching material are not radically changed. There is a lot of institutional inertia. Textbook publishers want to stay with their old, profitable business models. Faculty are used to adopting a single textbook with ancillary material like PowerPoint slides and test banks. Adopting the same textbook year after year is expedient. They have investments in familiarity with a given textbook, prepared lectures, course outlines, and so forth. School administrators are also slow to change. For example, little or no consideration is given to time spent developing new teaching materials during faculty evaluation. We don't know the future of teaching and teaching material, but it won't center on digital textbooks, learning management systems and recorded lectures. We will have things like modular teaching material, peer teaching, open source and subscription models rather than book purchases, very large classes and things yet to be dreamed up. 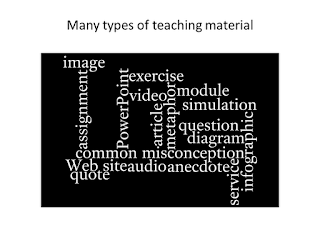 Teaching material will be fine grained and narrowly focused on a specific concept or skill and will be used by faculty, students and self-learners. Change will come faster than in Gutenberg's time or the era of movies and television. The cost of experimentation is greatly reduced in the Internet era, and as we see here, there is an attractive economic incentive. The textbook industry is an oligopoly and textbook prices have risen faster than inflation for many years. Faculty members at every university are creating and experimenting with new teaching materials. There are many non-profit and publicly-funded experiments in creating and curating teaching and leaning material. And, as we see here, the private sector has noticed the opportunity provided by the price gap shown above. The Internet has disrupted many industries and organizations. Will the university be next? For example, what would happen if massive classes with hundreds of thousands of students turn out to be good alternatives for, say, half of the undergraduate curriculum? Which will look better on your resume – a certificate of completion from Stanford or MIT or a bachelors degree from California State University, Dominguez Hills? Will schools that focus on teaching survive? Will universities be able to fund research? Will a better educated work force improve the overall economy? For more information, see this teaching module. The first shoe drops as Cengage files for Chapter 11 protection That is what happens when you mix the greed of a private equity fund with falling market demand for print textbooks. Some faculty will have to revise their courses (shudder) if they drop unprofitable print textbooks. Google has joined Amazon in selling electronic text books. For more on the decline of the textbook, click here. 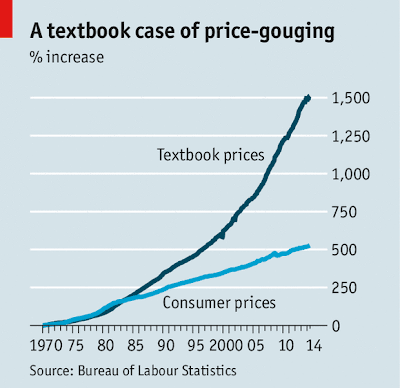 The Economist reports that US textbook prices have risen much faster than general consumer prices. (ITextbook prices increased over fifteenfold since 1970, three times the rate of inflation). 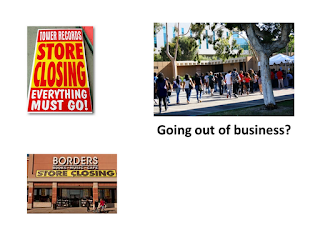 Prices increase because the students who purchase the books are not the customers of the textbook publishers -- textbooks are sold to professors who adopt them for their classes. 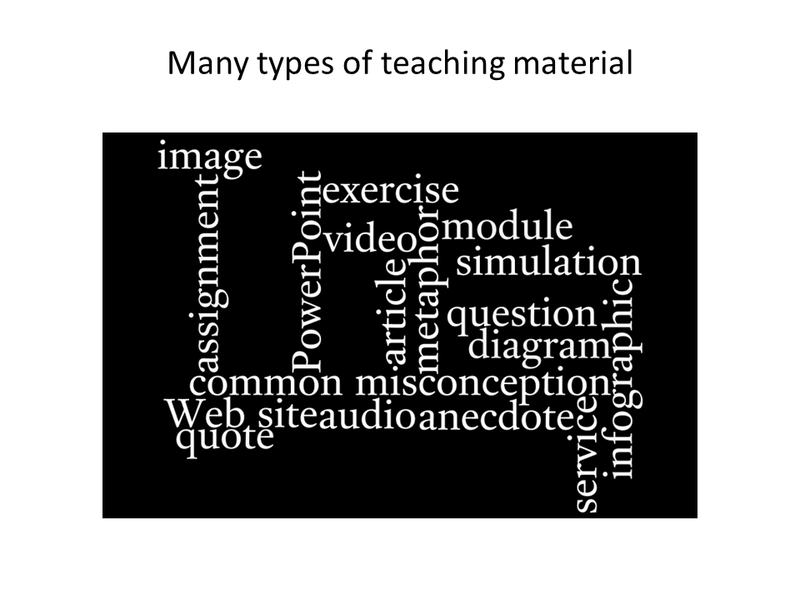 Professors are very busy (and some are lazy) so they like textbook packages which include PowerPoint slides, ancillary material, test banks, etc. It's also easiest for them to teach using a new edition of last year's textbook. Textbooks are still with us, but these price increases cannot be sustained. The Public Interest Research Group reports that 65% of college students have opted not to purchase the textbook for a class and 94% of them think it has hurt them academically. (That makes me wonder about the 6% who feel fine without the textbook). Students have alternatives to the purchase of print textbooks -- e-textbooks, open educational resources, library reserve copies, textbook rentals and, most important, a variety of online courses and materials. The print textbook market is beginning to crack. A while ago, Google invited cities to apply for subsidized installation of fiber infrastructure, and Kansas City was selected. They have now completed detailed engineering plans and are ready to begin installing fiber in Kansas City. There are many models for fiber infrastructure ownership -- a mix of private companies, government agencies, home and building owners, etc. For example, the ownership of a portion of the infrastructure by Swedish government agencies has enabled them (and others) to surpass US Internet service. Here's to the Google experiment and what we may learn from it! (This fell through the cracks and was not posted at the time I wrote it -- better late than never).